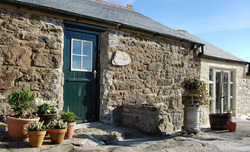 Hello and welcome to our self-catering cottage in far west Cornwall. Set in the rural parish of Sancreed with a large garden and beautiful views, Dairy Cottage offers peace and tranquillity as well as easy access to all coasts. Dairy Cottage is a Grade II listed building which was once an 18th century milking parlour. It has been tastefully converted by the owners Simon and Penny Rumble who live nearby.